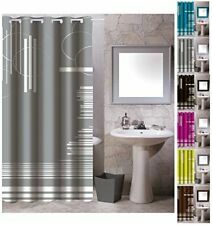 Upgrade your bathroom décor in an instant with this gray printed waterproof shower curtain. 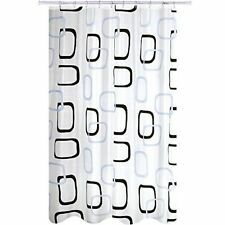 Easy to maintain, the curtain just need a quick rinse or a wipe-down after use to avoid any mold or mildew. Ready to hang with twelve tear resistant heavy duty eyelets. Easy to clean. Instantly update your bathroom with the Pillowfort Parakeet Paradise Shower Curtain in Bright Fern. Sturdy construction and a whimsical pattern will provide a lasting, fun look, and the buttonhole top makes this shower curtain quick and easy to hang. This bright coloured Mosiac Shower curtain is brought to you by Croydex. 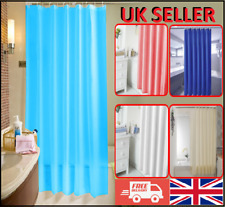 Croydex is one of the UK's leading supplier's of shower curtains and bathroom accessories. This product is made from a high quality PVC and is sure to add colour to your room with its various shades of blue in the Mosiac design. Contains 12 Rail Hooks. Machine washable at 30 degrees Celsius. Odour and stain proof. Dieser Duschvorhang kommt mit Ösen, dadurch können Sie ganz bequem Ihr alten Duschvorhang gegen den neuen ersetzen. Der Duschvorhang besteht aus 100 % Polyester, welches Sie einfach und bequem reinigen können. Includes 12 rings for easy hanging. 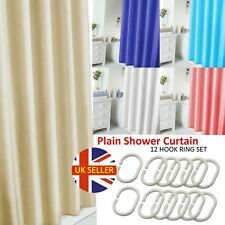 Shower Curtain with rings by Country Club. Includes 12 hanging rings. Clothing & Footwear. Halloween & Fancy Dress. Printed with a Mandela blue and teal circular Moroccan design. Create a colorful and joyful ambiance in your bathroom with the Croscill Ventura Bathroom Collection. 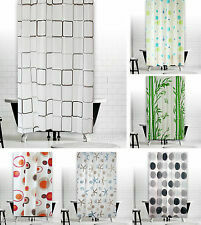 CROSCILL FABRIC SHOWER CURTAIN 68 x 72. Fine, loose stripes of colors that ombre from light to dark and back again makes up this simple but effective shower curtain. Add instant style to your bathroom with this embossed grey Shower Curtain from the Country Club range. Includes 12 rings for easy hanging. 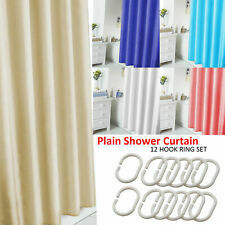 Shower Curtain with rings by Country Club. Embossed dark grey check pattern. 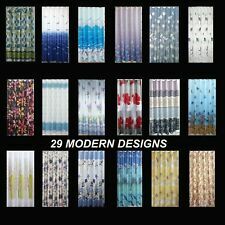 Threshold shower curtain textured gray dot Oeko-tex 100% cotton New!